Cuba's first major independent newspaper in more than five decades - a digital daily called 14ymedio - was quickly blocked within the island last week, but the big question is for how long the country's regime will be able to maintain its monopoly on the news media. Yoani Sanchez, the prominent Cuban blogger who launched the new digital paper with her husband Reinaldo Escobar and a staff of about a dozen reporters, is confident that ordinary Cubans will be able to bypass the government's censorship through a variety of technical gimmicks. 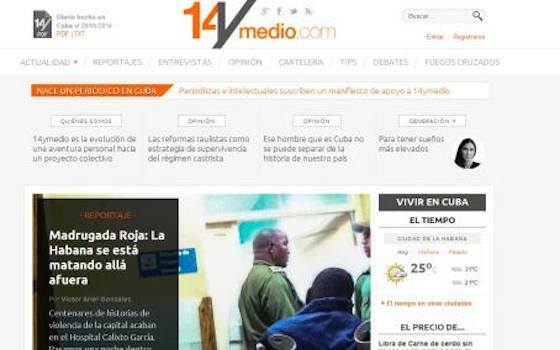 Right now, 14ymedio can be easily accessed overseas, but not in Cuba. Little more than an hour after it appeared on Wednesday, its website was hacked and redirected to a pro-government Web page called Yoani$landia, accusing Sanchez of trying to enrich herself with her new venture. But the Cuban regime's attacks in the past have not prevented Sanchez from becoming one of the world's most admired journalists. Sanchez has 609,000 followers on Twitter, compared with Cuban President Gen. Raul Castro's 130,000, and Cuba's official Prensa Latina news agency's 63,000. She has been awarded the world's top journalism prizes, and Time magazine has selected her as one of the world's 100 most influential people. In an article titled "Our first day," 14ymedio published among other things a report on a public letter of support signed by intellectuals from throughout the world, led by Nobel Prize winners Mario Vargas Llosa and Lech Walesa. Minutes after its birth, the website was blocked to readers on the island, the story recalled. But 12 hours later, the 14ymedio staff was celebrating. Staffers had been able to access 14ymedio through a proxy server - a program that allows people to conceal their computer's identity, which allowed them to access the website as if they were doing it from a foreign country. "Censorship won't be the most difficult obstacle we will have to breach," the 14ymedio article said. "Blocking 14ymedio could become a failed tactic if they want to silence us. There's nothing more attractive than what is prohibited." In addition to "proxy" severs, 14ymedio will be distributed within Cuba through the so-called memory stick "paquetes" (packages) or "combos" that have become ubiquitous on the island. Cubans buy memory sticks, also known as flash drives or pen drives, or get them from the estimated 500,000 Cuban-Americans - mostly from Miami - who visit the island every year. They use them to buy weekly "paquetes" of foreign movies, music, or news, on the island's black market. Much like people in other countries subscribe to a cable TV company, Cubans who want to circumvent the Communist Party-run media subscribe to weekly "paquetes." They take their pen driver to their supplier - a black market dealer - and get a fresh package of movies, music or news every week. "At the end of the day, the government will not be able to stop 14ymedio," says Raul Moas, executive director of Roots of Hope, a Miami-based group that sends cell phones, flash drives and other computer devices to the island. "Cubans are finding innovative ways to access and share information offline." Skeptics say Sanchez's 14ymedio newspaper will be - like blog GenerationY - much more popular abroad than in Cuba, for the simple reason that most Cubans have never had access to her writings because of the island's rigid censorship, and highly restricted Internet access. Cuba, alongside Haiti, Honduras and El Salvador, is one of the Latin American countries with less access to the Internet, according to World Bank figures. Only 25 of every 100,000 Cubans has access to the Web, mostly at very slow speed and one of the world's highest costs. The black market pen drive "paquetes" will not topple the island dictatorship any more than black market cassette tapes in the 1970s, video-cassettes in the 1980s, or satellite cell phones paid by friends and relatives abroad most recently, skeptics say. My opinion: I have nothing but admiration for Sanchez, Escobar and their team, who are pushing the limits of Cuba's censorship like nobody has in recent memory. They are true heroes of our times. Sure, Cuba's decrepit dictatorship will keep millions Cubans on the island from getting access to the Web site. But it's fighting a losing battle: today's memory sticks are much cheaper, smaller, and can store many more hours of videos, music and news than the old cassettes. The Cuban regime has shot itself in the foot by blocking 14ymedio at a time when the government officials are trying to convince the world that they are carrying out meaningful reforms in Cuba. They would have been much smarter if they had allowed the Web site, because as technology becomes cheaper, it will become increasingly more widespread, and more likely to beat censorship. "In Cuba, Technology May Beat Censorship"